Happy Citizen Science Day! In celebration of tomorrow’s annual event celebrating citizen science, also known as community science, we’re taking a moment to appreciate the dedicated volunteers who work with Defenders gather data that helps save species. Alaska Director Karla Dutton is partnering with dozens of organizations and hundreds of volunteers to conserve Cook Inlet beluga whales! ‘Big data’ is all the rage these days — that is, scientific information collected in massive quantities. But along the shores of Cook Inlet, Alaska, the data we’re collecting is colossal in its own right: in just 1 day, 1200 volunteers recorded 260 sightings of a species weighing 3,000 lbs and growing 15 feet long. The annual Cook Inlet beluga whale survey in Anchorage, Alaska — launched as ‘Belugas Count!’ in 2017 — is making a big splash as it rapidly raises public awareness and enhances the knowledge base. 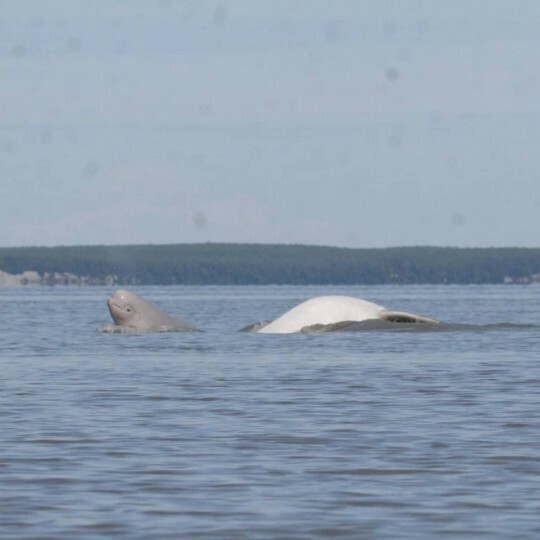 Although the ‘Belugas Count!’ program is fresh out of water, citizen science projects on Cook Inlet belugas have existed for more than a decade. 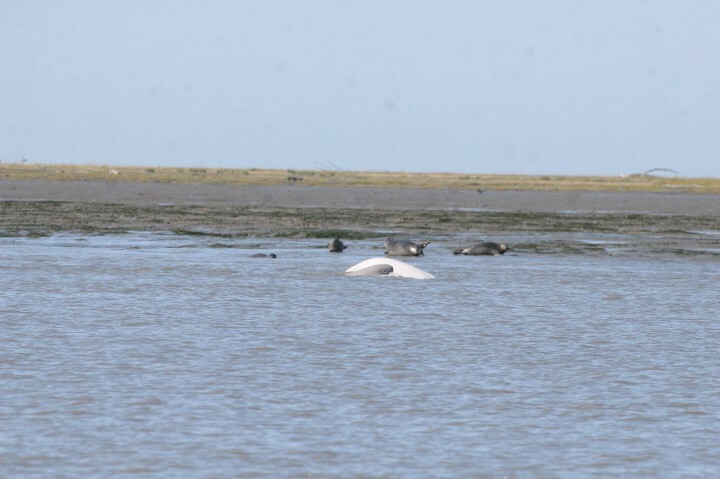 In 2008, Defenders’ Alaska office partnered with Friends of the Anchorage Coastal Refuge and helped to fund the Anchorage Coastal Beluga Survey (ACBS). 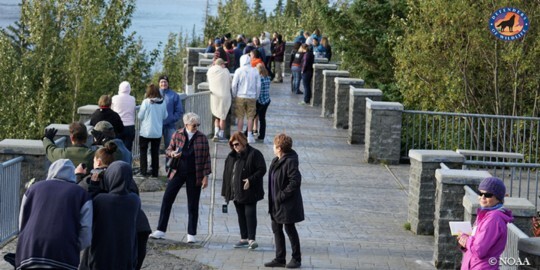 The ACBS gathered together dozens of community volunteers to spot whales over eight months each year in a transformative program that channeled the Alaskan community’s universal love for the iconic Cook Inlet beluga into a science-based metric for tracking species trends and behavior. 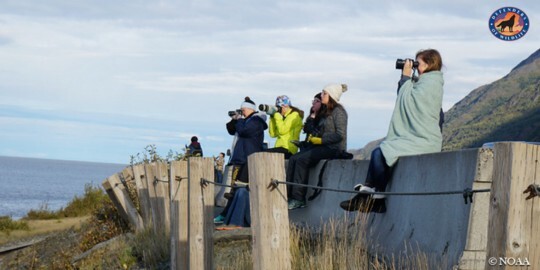 Over a four-year period, community scientists with the ACBS collected 450 observation hours documenting 77 groups and 507 sightings of Cook Inlet belugas, including 31 calves. These data contributed to the development of the Cook Inlet beluga recovery plan by enhancing scientists’ understanding of population health, fecundity (fertility), abundance (population numbers), prey needs and movement patterns. As a key partner in the ACBS, Defenders funded and executed logistics for the Ship Creek survey site, one of several sites along the coastline of Anchorage. I scheduled volunteer shifts, managed data sheets and outfitted our community scientists with equipment for surveying belugas. Each shift received spotting scopes and tripods, which volunteers used to scan for whales at their outlook. Our scientists also received marine binoculars with a reticle rangefinder, which enabled them to calculate the distance to each whale. I equipped them with waterproof data sheets, on which they recorded the number of whales and the whales’ ages, color and behavior. The most important necessity for the project, each volunteer brought for themselves: perseverance, patience and excitement to spot some belugas and contribute to their conservation! When the ACBS disbanded in 2011, I was worried that the community’s excitement might flounder, along with conservation efforts for the beluga. But in 2017, Defenders joined forces with the National Marine Fisheries Service, state agencies, local and national organizations and hundreds of local residents to redirect community science efforts into a new program called ‘Belugas Count!’. The first event in September 2017 went swimmingly and streamlined attention to endangered Cook Inlet belugas, whose population continues to decline. Under the watch of our community scientists, who aid agencies in monitoring, research and conservation of the species, I remain hopeful that the population of Cook Inlet belugas will rebound. And we’ll have the ability to contribute vital data to the effort. Save the date for the 2018 Belugas Count! survey on Saturday, September 15, 2018. This event will expand from Anchorage to also include new survey sites along the Kenai Peninsula. More details available here!